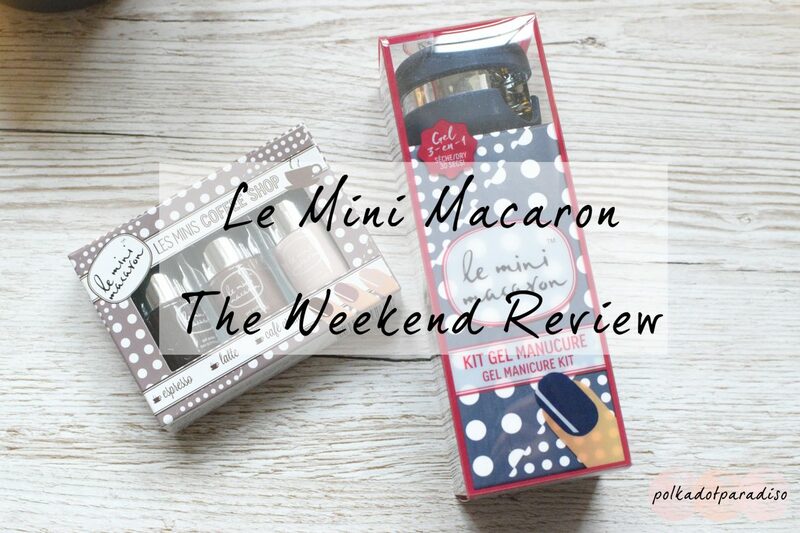 If you saw my French beauty haul, you’ll have seen Le Mini Macaron. After some frantic Googling for reviews whilst sat in a cafe in a shopping centre I decided to take the plunge and try this out. I’ll be honest, I was largely drawn in by the awesome packaging. I’m a sucker for packaging and Ed reminds me of this every time we’re out shopping. The size. This looks so small you could easily take it on holiday for touch ups/fixes. It comes with a USB cable. No more trying to find a free plug near to my desk. The Sensationail gel lap I have does not come with anywhere near a long enough cable. This, I can just plug into my computer or even a laptop. 30 second cure time and only two coats to complete a nail. That means you could easily do a whole set of gels in twenty minutes. This is about the maximum time I want to devote to any kind of beauty routine. Finally, the price. The starter set was only 35 Euros. So I picked up the starter set and the cute Coffee Shop minis set which were around 25 Euros. On opening up the packaging for the first time I was pretty impressed with what they give you as part of the starter set. Aside from the lamp and the USB cable you receive a full size nail colour that matches your choice of lamp. Then, along with the emery board and cuticle pusher (both of which are surprisingly good quality) you get ten removal packs. I’ve not used proper gel removal pads before but these are fairly easy to use. You simply open the top of the packet, insert your fingertip and seal the packet around your finger (there’s sticky bits on the packet). On the ferry back from France we got a cabin as it was a longish crossing. On walking into the cabin I was excited to see a little desk area with a USB socket. All I could think was, I can try my new gel nails! Prepare the nail by filing the top to make it rough. One very thin coat of the colour, which you then cure for 30 seconds. I was almost disappointed that it didn’t kill more of my ferry time but yes, after around 20 minutes my mani was complete. I was nicely surprised at how good it looked. The colour was rich and pigmented, and there was shine to the nails. Much more than you’d get with ordinary nail colour. The nails feel strong and sturdy like they would be ordinary gel but the surface definitely isn’t as thick. I have very bumpy nails and while normal gel would cover it up, this doesn’t as much. You can see in the picture that there are a couple of bubbles in one of the nails. This, and the huge chip on my thumb you can see in the next picture are caused by one thing. Not following the instructions properly. Remember step three, that talked about a very thin layer of colour? I didn’t do that. I applied this like I always apply gel and went for the ‘more is best’ approach. That really is a bad idea with this stuff. You can just about get away with it with regular gel polish (though less is best there too) but not with this. Because it was too thick, it didn’t cure properly and chipped really easily. It also didn’t remove too cleanly, again because it hadn’t cured properly. There’s definitely a sweet spot when it comes to applying this. If you make the layers too thick, it won’t last and if they’re too thin, the colour won’t be opaque enough. This isn’t too much of a problem with the darker colours, but can be with some of the lighter ones. The lightest colour in the coffee minis set can be a tricky one to get right. It’s easy to tell when you’re using too much as your nail gets warm as you cure it. Not so easy if a layer is too thin but if you cure your nail for a second time and it’s not quite opaque enough, you can just go for another thin coat and that should sort it out. I’ll be honest here and say I don’t like removing my gels the proper way. It takes too long and is a bit of a mess. This stuff just chips away like a nail polish and once it’s ready will easily chip/peel away. Because it’s not as thick as regular gel, it also doesn’t take half your nail away with it. The removers you get with the set aren’t too bad to use, but I like to save them for emergencies like I’m halfway through my mani and I’ve completely ruined a nail somehow. At the moment, the only place you can buy Le Mini Macaron in the UK is Feel Unique. Unfortunately they only have sets available to buy, no singles. You can order singles from the Le Mini Macaron themselves but then you have customs to worry about. With this in mind, I decided to try the Sensationail Express Gel Colour. Something that I’d reviewed and hated previously. Why did I try it again? Because I realised that the reason I hated it might have been because I applied it too thickly and the instructions didn’t really stress that the layers had to be thin. As it’s another 30 second cure time gel, my thinking was it should work just fine with the Le Mini Macaron. If it did work, it meant I had way more colours to choose from in the UK. I’m really impressed with the level of shine here. It was extremely easy to apply (I actually prefer this brush to the one in the Le Mini Macaron bottles) and it cured perfectly. I wasn’t super stingy with the gel layers as it was a pale colour and only once did my nail get warm. Once complete the layers didn’t look too thick and the finish was the same as with the Le Mini Macaron colours. This is also a beautiful colour, so I’m glad I’ve been able to get it working for me. Unfortunately, the Sensationail colour didn’t last as long as Le Mini Macaron’s colours. I was only really about to get about fives days out of this (four days of that I wasn’t at work) before it started chipping. I’ll probably pick up more Sensationail colours if they have shades available that Le Mini Macaron doesn’t, otherwise I’ll just stick with the actual Le Mini Macaron colours. This is a lovely piece of kit, at a really good price. I can’t get over how easy it is to do my nails now. I thought I’d be bothered by the fact that you can only do one nail at a time but because of the short cure time it’s not a problem. My favourite thing about this machine though? It doesn’t bleep! I hate that my Sensationail one bleeps. If you want a manicure that’ll last 7-10 days that doesn’t take an hour to do I highly recommend this. It takes just 20 minutes to do, and if I’m just in the office I can easily get a week’s wear out of it. This is a much better alternative to traditional nail polish for me or time consuming gels for me.